We interrupt this book blog to bring you a very important message. 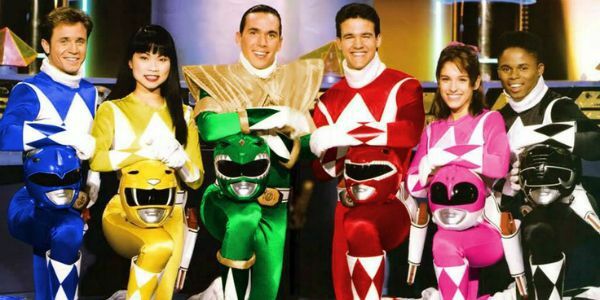 I realized, recently, that if my life as a consumer of fiction had an origin story, it would start with a little TV show called Mighty Morphin Power Rangers. If you want to get technical, my first fandom was probably Barney, and there may have been some overlap between the Rangers and Sailor Moon. But I am certain I would not burst into joyful tears during a trailer for a Barney remake the way that I did for the 2017 Power Rangers preview. And when I look back, that franchise begat a lifetime of enthusiasm for fictional worlds, for binge-watching and live-tweeting and merch-buying and midnight release-attending. Power Rangers made me a geek. And it wasn't until I saw the trailer for the reboot that I started thinking about how much of an impact an absurdly cheesy, poorly written children's action show had on the rest of my life. 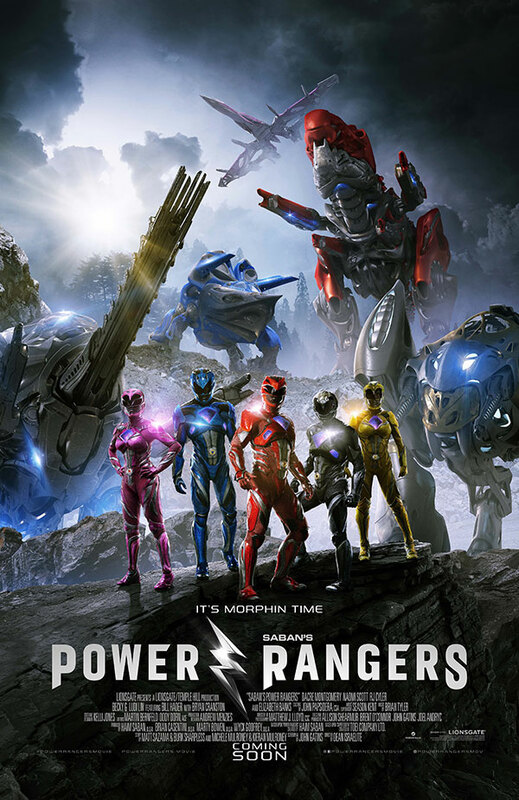 When I first saw the teaser trailer for Power Rangers, I wasn't even fully aware there was a reboot in the works. I felt a vague sense of familiarity as I heard Halsey's rendition of "Walk the Line" and saw the Angel Grove sign, and when I realized what I was watching, well, I was instantly a little girl again. Power Rangers was my indoctrination into geekdom. Other fandoms followed in quick succession, especially since the 90s were so great for animation. There was Sailor Moon. X-Men and Spider-man. Batman. Middle school and early high school were all about Harry Potter. Recently, I discovered my terrible (read: problematic) HP fanfics from my early teen years have amassed hundreds of positive comments since I abandoned them along with my forgotten AOL account. I once had a Potter fan site with a special page dedicated to Oliver Wood because I thought the actor who played him was cute. Then the Tobey Maguire Spidey movie came out and renewed my interest in Marvel. A guy friend nurtured my interest by giving me a Spider-man encyclopedia he had and discussing everything he loved about the comics with me before I ever stepped foot in the comic book store. I wish the men and boys who are so up their own asses about their fandoms would stop decrying what they consider "fake geek girls" and start encouraging new fans, male or female or trans or gender nonconforming, the way my friend did. I've had more positive interactions with geek guys IRL than online. I remember getting some crappy comments from guys whenever I wrote about or did a video on Doctor Who. Like the commenter on a Rose Tyler makeup tutorial who said if I were a "real" fan I wouldn't be doing makeup tutorials. Um ... did I miss the episode where the Doctor fought the CEO of Revlon? Power Rangers was the first media franchise that I connected with. The show made me feel excited. It made me feel happy and, well, empowered. The idea of strong women who could beat the bad guys was never foreign to me, because Kimberly and Trini were there and they were gorgeous, feminine and could roundhouse-kick a Putty's head off. Femininity and power were not mutually exclusive for me. Recently, I was out of a job for more than four months. I'd had a really hard time in the months prior to that, and I didn't feel up for much other than sitting on the couch with my dog, Lola, and watching TV while scanning Twitter for updates on the political apocalypse. That's when I retreated into the safe, comforting world of geekery. I binge-watched a lot of shows — like, a lot a lot — but particularly, I watched everything in the Arrowverse, starting with The Flash. I'd spend all day watching episodes, Googling character wikis, reading recaps and formulating theories. Like Killer Frost, I am a heat vampire, but for passion. I become deeply, obsessively passionate about things. I found out Rose McIver from iZombie was Ranger Yellow on Power Rangers RPM and watched that, and kept watching because Adelaide Kane from Reign played the villain. I watched the Power Rangers trailer over and over, watched every sneak peek, replayed every Andre the Black Nerd video about the movie. Everything about the movie was perfect to me. The plot, the palette, the action scenes, the beautifully diverse cast of talented young actors who portrayed class differences and the autism spectrum and queerness with nuance and compassion. It was funny yet heartfelt, unabashedly commercial (does anyone else want Krispy Kreme doughnuts all of a sudden?) yet painfully earnest. I laughed and cried and gasped. I'm sure critics panned it. I wouldn't be surprised if the many planned sequels fall through. And yes, it may have been on the same level as the lowest common denominator superhero flick and only leaps beyond the TV show because of the higher budget, but damn it, I LOVED it. Recently, I had a very bad day. The kind of day that I might have met with any number of creative destructive decisions in my repertoire. But instead of going off the rails, I took myself to see Power Rangers a second time. Because I already knew the plot, I could focus on the details and take in the shots, the colors, the dialogue, the elements of craft. I say "craft" with no irony. Fight me. I only took one cinema studies class in college so I'm no film buff, but I will fight you on this. I will fight anyone who says Power Rangers was just a soulless popcorn flick. And in the end, I don't care whether Power Rangers beat Beauty and the Beast at the box office. The Rotten Tomatoes score doesn't mean jack to me. What I know for sure is that fandom has saved my life more than once. And maybe we'd all do well with letting go of the baggage of adulthood sometimes and channel those teenagers with attitude we once were.